When shooting with manual, if you aim your analog stick directly pointing at the far right side of the goal, and give your shot enough power to reach the very top of the goal, your shot will go into the top corner. It is all a matter of power and direction, which is 100% controlled by you, not the computer. In comparison, with assisted controls your shots have a little help from the computer, but this also makes it so much harder to consistently hit the far corners out of the keepers reach, making it more a matter of luck than skill. Likewise, manual passing is the same concept, pass direction and strength are both controlled by you only, with no help from the computer. 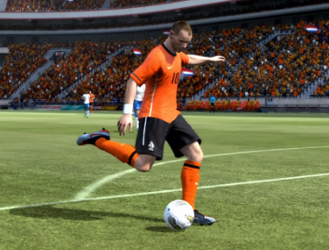 More specifically, you can set manual controls for regular passes, through balls, crosses, and regular lobbed passes. This is useful because for example, you may want full control over your through balls and crosses and set them to manual, but still would like to keep assistance for regular passes and lob passes. Personally, this is what I do. If you have never changed your settings, then you will have full assistance on every setting except for crosses, which is set to semi-assisted by default. Many people want to switch to manual settings because at times, it can feel like the game is played for you by the computer. The transition from assisted to manual is very tough, you might be discouraged that the fact that some of your shots go out for a throw-in or that your crosses never land in the box. Obviously, this is very frustrating and you'll probably quit the first few tries of converting to manual settings, but it is worth it in the end. When you get good enough, you'll put away every chance, make spectacular shots from distance, and your passes will go exactly where you want them to. Not to mention, it's loads more fun than the default assisted controls.